Politics brings to limelight the worst amongst the people and also allows them to showcase their dark side! No wonder the manipulators, morally corrupt, divisive, power mongers amongst us become successful politicians, world over. Canada is no different. That is why like many commoners who do not even vote, I shy away from politicians and their parties and in almost three decades of enjoying voting rights, I have only voted twice, once in India when I first got to vote there and once in Canada when I first got to vote here! Not anymore. This election is different. This has been made personal for me and millions by the ruling Prime Minister, Stephen Harper and his Conservative party and their autocratic, divisive, regressive policies breaking down the very foundation of this great nation of immigrants. And this will not be a silent protest but a loud roar which will make my fellow brethren rise from their slumber and use this only opportunity available to the ‘Davids’ in years, to beat the giant ‘Goliath’ of our collective creation! To empathise with our pain you will first have to understand what Conservatives stand for. In real terms! Conservatives in Canada, like their counterparts going by any other name world over, stand for a society which ‘totally’ believes in Conservative values. In every walk of life. Be it in religion where the prescribed religious values are sacrosanct, or in Economy where growth can be compromised for budget balancing or in society where ‘majority’ view is what is made the law, without weighing it on the scales of morality or ethics. Conservative parties display an authoritative bend of mind displayed by their leaders. We have been used to seeing such dark forces rule in many parts of the world, be it in Middle East, Africa, East Europe, even China and can see its ‘Avatar’ (incarnation) in the forces of ‘Hindutava’ in India too. Unfortunately, with the majority that he enjoyed, Harper has dragged Canada too amongst this group and perhaps, learning from him, his pupil-in-principle, Donald Trump, if elected, is planning to do the same for our neighbor. But Harper is the ‘guru’. Hands down! Looks like Harper loves to hate immigrants and planned his worst for them or anyone aspiring to be one. A few years back, with one stroke of pen, applications for residency of thousands and thousands of families were rejected in the name of making changes to the immigration policy. Many of these families had kept their lives on hold for years waiting in line for a day when they will restart their life in Canada as they had applied to relocate here. Imagine one day being told that all that wait is worthless because one Mr. Harper has retracted on the very norms that made them qualify earlier! You will not hear of this much in Canada media as it is not a ‘local’ news but the pain and angst of thousands is real. The tragic death of the Syrian boy ‘Aylan’ is just one extreme example of an anti-immigrant policy of Harper’s regime but there are thousands more who wasted their golden years due to the sudden retroactive changes made by his government. 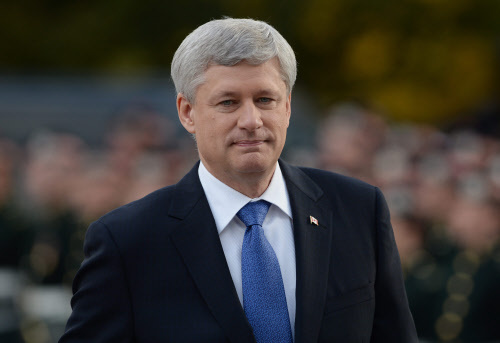 Harper then went a step ahead and got Bill C-24 made into a law last year. In one moment, that one bill took Canada almost a century back and made second class citizens of MILLIONS of Canadians. And it does not apply to just the new immigrants of this decade but to almost everyone who was not a Canadian or British citizen before 1947. Or even their children born here. In the name of fighting terrorism, Harper created a draconian measure that could make any person who government can hold to be responsible for acts against national interest including even a minor crime like giving fraudulent representation in citizenship application, be deported back to the country from where he or his ancestors came from as long as it is allowed by the UN Charter. And there is no judicial reprieve. The minister or any bureaucrat can decide and get you deported. That’s justice delivered Harper style! So if one has even mentioned the date of birth erroneously in the citizenship application then one can be deported back to their country if the government so desires. I pay my taxes, I do all my duties, I have become Canadian after a rigorous process meeting all criteria that Canada desired and yet, I am LESS Canadian than a REAL Canadian, read perhaps Caucasian, who could have committed murder. My integrity is questioned at all times and I need to PROVE my love for Canada at all times and not just me, my children or THEIR children born here have to prove it at all times. Harper has converted this nightmare into a REALITY for millions of Canadians ! Harper did not stop at this but this year went ahead and got BILL C-51 made into a law. The so called Anti-Terrorism law further ensures that people can be arrested and criminal charges put on them even if a suspicion or doubt is raised that they ‘might’ support anti national activities. So even people protesting or agitating for an act which ‘may’ be labelled anti-national can be arrested. So much for freedom! On the economic front, Harper first made sure that rules are made as tough as possible for outside investments to flow into Canada. What could have created enormous job opportunities, built new industries and created great investments in Canada by hard working people world over was crushed in the name of fictitious fear created of ‘bad’ money. On top of that , he continued to focus on Conservative policies of budget balancing rather than working on an agenda of growth leading to further tightening of capital and shrinking of economy. Further, he continued to develop a climate where the experience and knowledge base of millions of newly arriving immigrants is not recognized leading to a creation of a vast labor force of under employed, under paid, English speaking labourers who could have become the very back bone of development. Harper did not even learn from our Southern neighbors who did the opposite, allowed the investments to flow in at all times, enabled companies to nurture and utilize immense professional talent worldwide, enabling US to not only grow by more than 3% but have one of the healthiest economies in the world today. And Canada? We have been OFFICIALLY declared to be in RECESSION last month based on the negative growth of the economy in the past year. So much for Harper’s economic policy! Harper has ensured that our scientists have been brought under strict censorship and cannot speak out against any climate change measures being followed by the government and a section of industries. He has curtailed the scope of work of Statistics Canada and a host of government agencies working on research and his dislike towards information flow is evident at all times, whether it is in the isolation of any type of hostile media or in the censorship of government agencies at all levels. Does Canada still sound like the promised land or is it more and more resembling a banana republic which Harper is trying to convert it into? Can you not foresee a nation which will become more and more dictatorial as its leader? And when he does not have any empathy for the weak, the poor, the visible minority, would it not be a matter of time when he becomes more and more greedy and more and more powerful and decides to use any means to crush any dissent? Harper’s way or high seas! Right? History repeats itself and only fools can ignore the signs! Not me! Not you! Not any soul who cares for this great nation and the inclusivity that it represents! It’s time to speak out. Let us say NO to divisive politics. NO to hatred. NO to fear. NO to Conservatives and NO to Stephen Harper. It’s time to say YES to LIFE. YES to inclusivity. YES to economy and YES to a Canada destined to be the world’s HAPPIEST and GREATEST NATION! P.S. : The author does not belong to Liberals or NDP or any other political party but is just a common citizen who has decided to speak for the truth. Previous OYE KANADA, TUSSI GREAT HO!